United’s Polaris business class from Heathrow to Newark is one among many premium products vying for passengers on the crowded transatlantic route between London and NYC. Pros: amazing bedding, great lounge at Heathrow and solid food. Cons: not a lot of stretching room for taller passengers and somewhat rushed service. With almost 40 flights per day between New York City and London, competition is fierce on the route, and thus it can be tricky to decide on which flight is best. If you’re looking to use your points, a good bet is United and its several daily Boeing 767 flights between Newark (EWR) and London (LHR). When I had to make my way home from Africa, I was able to find a Star Alliance award that would take me over 7,000 miles from East Africa to the East Coast of the United states — all for 75,000 miles. After a great flight with Ethiopian Airlines, I was eager to try United out on this extremely popular (and competitive) route to see how it stacks up against the competition. My particular flight was operated by a 767-400ER, sporting an interesting 2-1-2 configuration up front. Read on to see how United fared on this transatlantic hop. This flight was the final leg of my trip home from Addis Ababa, Ethiopia. After a redeye flight from ADD and a few hours in the excellent United Club at LHR, all that was left of the journey was this flight on a United 767. As I explained in my review of Ethiopian’s business class, we booked this trip through Aeroplan. It cost 75,000 miles (and $95 in associated taxes and fees), transferred at a 1:1 ratio from American Express Membership Rewards, to get me the 7,000+ miles from ADD to NYC, via LHR. United Airlines Flight 17, from Heathrow to Newark (EWR), departed from Terminal 2B. As a connecting passenger, I had to clear customs and go through security again; check-in was handled by agents near the customs area for those who hadn’t checked into their flight. With nearly four hours to spend at Heathrow, I felt a lounge visit was certainly in order. As a Star Alliance business-class passenger, I had several lounges to choose from, including Singapore Airlines, Air Canada and United — though United’s offering came highly recommended to me by TPG United guru Zach Honig. To get there, I had to trek through the underground walkway and onward to customs and immigration in the main Terminal 2 building and then back to 2B for the lounge. Rest assured, the walk was worth it — find out why in my full review of the lounge. Equipped with five shower rooms, hot food, a beautiful bar, open seating, Wi-Fi and views of the ramp, this United Club is probably the best in the network. In fact, I’d say that this lounge is a must for passengers with time to kill before a flight. Even economy-class passengers can enter, if they have the United MileagePlus Club Card. From the window, I caught a view of our aircraft: registration N78060. With about 20 minutes until boarding, I walked for about five minutes to the gate, where our United 767 sat under overcast skies. United has three distinct cabin configurations in the premium cabin across its fleet of 767s: the brand-new (but elusive) Polaris 1-1-1 seating configuration; the pre-merger, forward/backward United 2-2-2 seating; and the one featured on my flight, B/E Aerospace Diamond seats arranged in a 2-1-2 pattern. The pre-merger UA 767 cabin configuration — a three-class layout that includes a first-class cabin — will disappear, but it will be some time before United retrofits its entire 767 fleet to feature the new 1-1-1 seating. So, if you’re flying a United 767 on transatlantic flights in the near future, especially to/from Newark, this seating arrangement is what you’ll likely encounter. This 767-400ER featured 39 Polaris business-class seats, each capable of going fully flat. Behind the business cabin were 70 economy-plus seats and another 133 standard United economy seats. One of the most pressing complaints from United premium-cabin passengers is that these aging seats provide inadequate privacy. As with most business-class cabins with more than one seat stacked against the windows, it’s hard to get out of the window seat if the aisle passenger is eating or in bed mode. This is where the 2-1-2 configuration made it interesting — with this configuration you can indeed choose a seat that features direct aisle access and doesn’t have a seat directly adjacent. If you’re interested in trying one out, be sure to select a seat in Row D.
I was in Seat 1L, one of the more private seats onboard, nestled next to the window in the very first row. Since I was in Row 1, I could actually notice the curvature of the fuselage, which was pretty cool for this AvGeek. My seat was neither new nor squeaky clean, but it was comfortable. There were three sleep-related goodies waiting for me: a Saks Fifth Avenue blanket, comforter and full pillow. As I took my seat, I noticed more storage space than I expected on the inside of the seat, along with individually wrapped headphones, an amenity kit, a universal power plug, headphone jack and USB charging port. .
On the other side was a relatively standard side table for drinks, a small privacy divider and seat controls. Another advantage to the bulkhead: a large footrest. Many airlines, including United, offer much larger footrests in the bulkhead rows of business class. In fact, Row 1’s footwells appeared to be nearly twice as large in the other rows. The footrest was well-padded and included a small but useful shelf above the foot cubby to store smaller items. I went fully flat to sleep, and used the comforter as a mattress — I slept wonderfully. I’m not particularly tall at 5 feet, 9 inches but my feet did press against the wall when I stretched out, but it didn’t hinder my ability to sleep well. 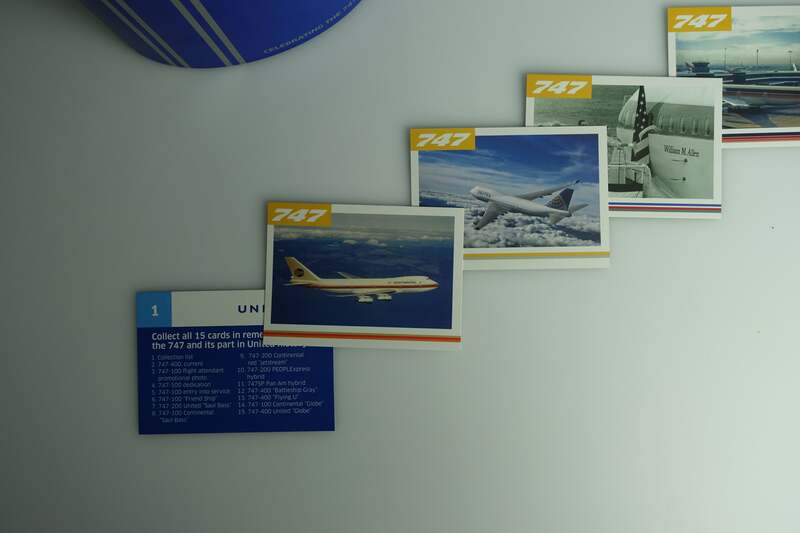 United offered an extensive catalog of entertainment, though the screens themselves felt slightly outdated and less high-definition than those competitors use. It didn’t offer any of the nifty features that Ethiopian’s brand-new A350s do. My favorite United feature is Live From the Flight Deck, a system built into many United jets through which passengers can listen to all radio communications between their pilots and air traffic control. However, it’s often not turned on, unfortunately. Some other non-TV or movie options that were available included travel trivia and meditation podcasts. When I took this flight, United was still handing out 747-themed amenity kits in honor of the Queen of Skies’ retirement from its fleet in 2017. Mine came in a blue metal cylinder, though others were gray. Included in the kit were the usual tissues, earplugs, sanitizing wipes, lip balm, moisturizer and lotion, reusable toothbrush, toothpaste, socks, eye mask and miniature pen, plus special 747 goodies like retro 747 cards. Also included was a coupon for 20% off on Cowshed products. All in all, a pretty substantial kit for the heavily trafficked route. United provided a noise-canceling headset for all business passengers, and you could use this set from gate to gate (unlike, say, American, which offers higher-quality Bose headphones but collects them before arrival). United’s double-pronged headphones far exceeded many shoddy economy-class headsets but weren’t spectacular by any stretch of the imagination. The bedding, on the other hand, was superb. These business-class seats are definitely not the newest in the sky, but they’re still well-padded. And because United gives out both blankets and comforters, you can really enhance the comfort quotient at your seat. I’ll say it again: The bedding was excellent — some of the best I’ve ever had. In fact, there’s certainly an argument to pick United over other airlines on this route (and other transatlantics) if your primary intent is getting a good night’s rest, as the bedding is as good or better than what its competitors offer in business class between New York and London. I slept so well that I woke up with barely an hour left in the flight, over northern Vermont. We were served two meals on this flight — lunch and lunch, part two. Almost immediately after boarding, a friendly flight attendant took my drink order and hung up my coat. With my club soda came a Polaris-branded box of chocolates. I was surprised to see the soda served in a plastic cup, especially given that many competitors serve beverages in true glasses on this route. In any case, a few minutes later, flight attendants came around to distribute menus. Lunch service began with a refreshing hot towel about 30 minutes after takeoff. Before I knew it, I was snacking on a mixture of warm nuts served in a Polaris-branded bowl. For my next beverage, I went with a Heineken, which was served in a glass. In my opinion, United’s food presentation could use some work, but my appetizers and breads were solid. I got both a fresh pretzel roll and garlic bread, and even the salad was delicious despite its lackluster appearance. The tortellini, on the other hand, was weaker. It tasted like airplane pasta: reheated, and the sauce had a sort of ketchup-y look. I wish I’d gotten the braised beef that my seatmate seemed to enjoy immensely. I was tempted by, but didn’t succumb to, the classic United sundae cart. Two hours in, I went fully flat and, with the help of that sublime Saks bedding, fell right asleep. Upon waking up with just about an hour left of the flight, I requested a cup of hot tea, and my second lunch arrived. For this meal, I went with the chicken over a cheese plate. The meat was a little bland, but the salad and couscous were delicious. As I finished eating, one of our pilots came on the PA and announced that we’d be landing in 20 to 25 minutes. He also included which runway we’d be landing on (22L) and our gate. After a smooth landing and short taxi, the flight was over. Within 10 minutes of de-boarding, I was through customs and immigration (thanks, Global Entry!) and waiting for my car back to Brooklyn. My United Polaris experience was positive. I arrived safely, comfortably and well-fed after a smooth flight from London. Though the flight attendants were nice and helpful, I felt like the overall service was rushed, partly due, of course, to the relatively short flight times for the hop from London to NYC. The bedding, the food and the lounge in Heathrow, on the other hand, were high points I’d like to emphasize — more specifically, the bedding (did I mention the bedding?). If I were looking for the best possible flight to London in business class, I would shop around. Unfortunately, besides American’s 777-300ER JFK-to-LHR service, Delta’s A330s and perhaps an occasional retrofitted United 767-300ER, there actually aren’t many superb business-class seats to London. Still, you may be able to snag one of these business-class seats for a great award rate, like I did. In that case, I wouldn’t hesitate to fly United from Newark.